The 10 Best iPad Styluses - Mightier than the Sword! The late Steve Jobs (may he rest in peace) was not a fan of the humble stylus. In fact, he’s on record saying some pretty nasty things about them, like “Yuck” and “Over my dead body”, which is ironic, really, given that not too long after his death Apple released the iPad Pro, which is compatible with an honest-to-goodness official stylus dubbed the “Apple Pencil”. Whatever Steve may have felt, however, there are plenty of situations where a stylus is actually a better input device than your grubby chicken fingers. If you’ve ever tried signing a digital document or drawing a picture with a finger you know it is no picnic. Not to mention winter time, when you may not want to take off your glove just to check email. I’ve placed my top picks at the top, as usual, and the rest just sort of pile up in no particular order. OK, this should not be surprising. Apple makes the best (and most expensive) stylus for their own tablets. Before I say anything else about the Pencil, take note that it is only for iPad Pro devices and won’t work with other types of iPad. That was almost enough to knock it off top pick status, but the Pencil is just too damn good. 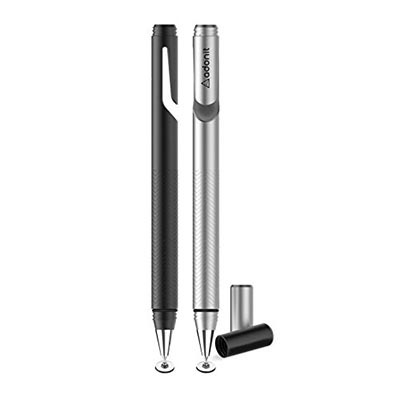 There are other, more affordable, styluses that work with a wider range of devices. You won’t find another that is as sensitive or advanced as the Pencil, however. It not only finely measures the pressure at the tip, but also knows the relative angle at which the pen is being held. This makes it basically the only real choice for serious artists who are using the iPad Pro to draw. Thanks to these two measurements, the Pencil lets you intuitively vary the line weight, do finely-graded shading, and create some effects that nothing but an actual pencil could formerly accomplish. Thanks to the fact that the Pencil was designed for the Pro, and vice versa, it can do things that 3rd party pressure-sensitive styluses can only dream of. 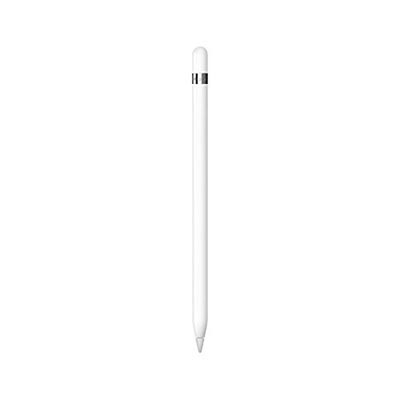 The Pencil and the iPad Pro are constantly talking to each other and the iPad Pro knows when the pencil is being used on the screen and when it is your finger. When the Pencil is detected the scan rate of the touch layer doubles, making the Pencil incredibly responsive. If you are a “Pro” and own a “Pro” then this is the only choice for you. Nothing else comes even close. If you take any interest in Apps at all you’ve probably at least heard of Pages, an app by FiftyThree. 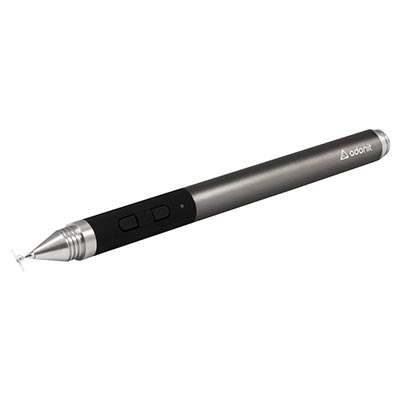 This clever stylus works wonders with that app, but is also compatible with a range of other applications. 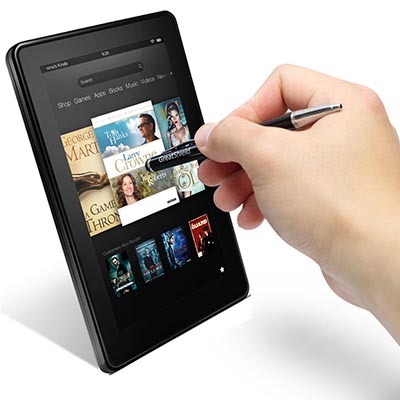 The look and shape of the stylus is definitely something novel and there are a whole lot of pretty cool features packed into its chunky frame. The best one to me is the eraser flip. 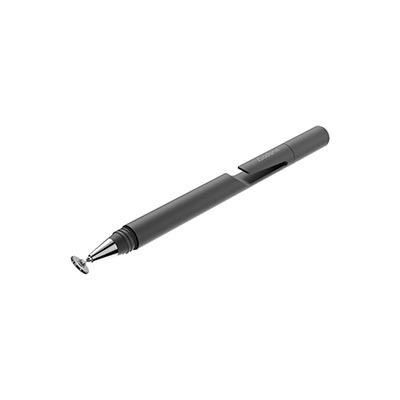 If you are using an app that supports it, the rear of the stylus will act as an eraser without any additional effort. The tip has various angles for lines and broad strokes. You can also vary line weight by using pressure. Palm rejection is another biggie. Clearly this stylus is gunning for the Apple pencil and it is doing it at less than half the price. It doesn’t have the responsiveness or extra tilt sensors, but palm rejection is there, which is actually quite important for proper artist types. The battery recharges via USB and one 90-minute charge is apparently good for about a month of “normal” use. All in all this is a device that has got a strong positive response, but still has some bugs to work out. Mostly there are complaints of unreliable connectivity and the need for too much pressure, which wears out the tips and eraser more quickly than you’d expect. Still, I think that FiftyThree is onto a winner here. I have owned an active Jot Pro Touch for a couple of years now and Adonit has always impressed me with the quality of their products. Their stuff doesn’t come cheap, but once you use it you’ll understand. The Jot Pro Fine Point lacks any sort of Bluetooth-enabled pressure sensitivity; it’s only a passive stylus. The upside of this is that it is much cheaper than something like the Jot Touch, which can easily go for a c-note. The party trick of these styluses (stylii?) comes in the form of the little transparent disc at the tip rather than the familiar pudgy rubber ball. This little disc may look pretty awkward, but once you have made use of it it all makes perfect sense. It glides across the screen and, since you can see exactly where the tip is touching the screen through the disc, it becomes very easy to draw accurate lines. You will, however, have to invest in some spare discs, as they do eventually wear out. 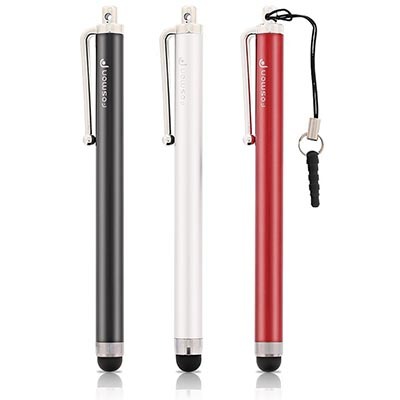 You can get the stylus in four different colors and it has a carrying clip. 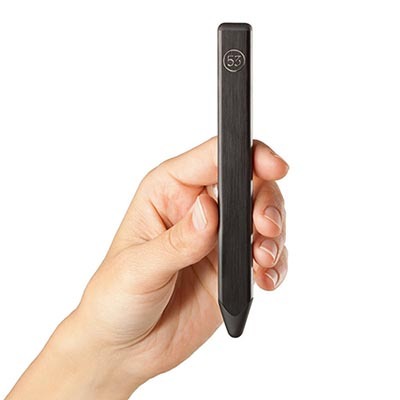 You are paying quite a bit, but remember that this is not a plastic stylus, but a lovely aluminum and steel one. It’s worth every penny. I have a real soft spot for AmazonBasics. Usually store brand stuff is a recipe for useless junk or bad-quality food, but Amazon has repeatedly shown that it sources good stuff at a reasonable price. In the case of this two-in-one pen and stylus combo they keep that tradition alive and have made something that’s better than average, but really cheap. At least, so it seemed. For a mere eight bucks you too can have a decent-looking pen that has a stylus tip where a pencil eraser would normally be. That’s my main problem with a product like this though. Using it as a pen is comfortable, but to use it as stylus you have to hold it upside down, which is decidedly un-pen-like. It’s a pity too, since these days my iPad is the reason I constantly find myself without a pen when cave people want me to scratch stuff on a dead tree for them. It’s very annoying. People who have bought it do, however, complain that the non-replaceable rubber stylus tip breaks quickly and, even when whole, doesn’t perform well on touch screens. Perhaps in this case it is a better idea to go for something a little less basic. Another stocking-stuffer from Amazon. This one does not sport any ink ability despite having the same price tag as its hybrid sibling. It still comes in the eco-friendly cardboard container that I quite like. I actually think the focus on simply being a stylus does this product a favor. This is the kind of thing you attach to your keys or other thing that is always on you, just in case you need to do some precise touch screen stuff that a finger just won’t hack. This is Amazon’s best-selling digital pen and I can see why. No frills, no fuss, no gimmicks – just a decent stylus for a good price. What’s special about the Fosmon trio? Nothing as far as I can tell. They have pocket clips, they are compatible with any capacitive screen, and they are as basic as it gets. The thing here is that you get three for the price of one, so if you’re in the habit of losing your stylus then this is probably a good buy. Hey, isn’t this cute. It’s the same Adonit stylus but mini. Maybe too small for an iPad, but maybe just right for an iPad mini? All the same points about the full-size version apply, so go read that and halve the expected size. Before the Apple Pencil, the Jot Touch 4 is the stylus I would have recommended for any seriously “arty” types who have an iPad. I’ve actually played around with earlier versions of this stylus and found it to be reliable and of good quality. 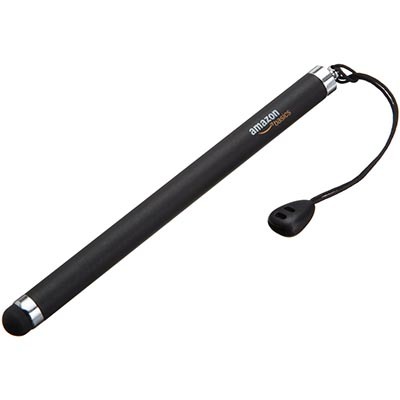 This stylus is easy to connect via Bluetooth and has palm rejection, which is a must if you want to draw well. However, in order for palm rejection to work the paired device must support Bluetooth 4.0. That means it has to be a New iPad or Mini and newer. Also, when using version 4.0, battery life is claimed at a month, which is amazing for a product like this. It also has some neat shortcut buttons on it that let you do things like undo your last stroke, which is great, although less intuitive than the FiftyThree’s eraser tip. Do make sure that the app you plan to use the Jot with actually supports it, since none of those 2000 levels of pressure sensitivity will do you any good if they are switched off. Price-wise the RRP for the Jot puts it mighty close to an Apple Pencil, so if you actually own an Apple Pro, you know what to do. But more often than not I see the Jots go for much less and it is definitely worth it if you can pick one up for a song. The name “Dimples” puts me in mind of a 50s mobster talking to his favorite showgirl. I really have no idea why it is being used here. Anyway, this very-affordable stylus actually has a pretty interesting gimmick. It is actually two different styluses stuck end to end. At the one end we have a traditional ball-type tip and on the other side we have a clear disc with a thin tip very reminiscent of the products from Adonit, which may very well be reaching for the old lawyer hotline. It comes with replacement tips for both ends. It’s made from stainless steel and aluminum; if you don’t feel the need for active features such as pressure sensitivity you may as well save a few bucks and buy one of these. Another “twofer” stylus graces our presence in the form of the Greatshield. 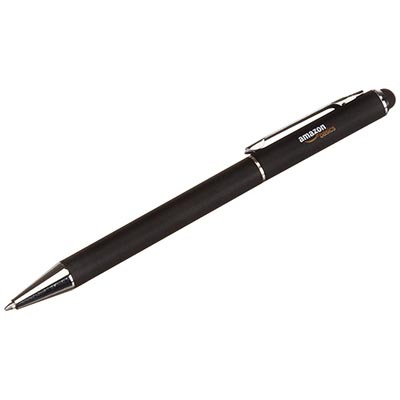 On the one end we have a bulbous traditional capacitive stylus tip; on the other side a twist-activated ballpoint pen. 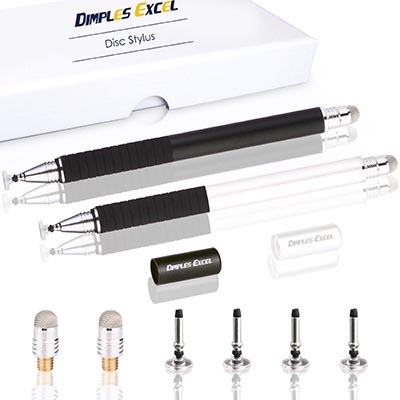 Courier delivery people everywhere love styluses like these since it means they can work their PDAs and sign the paperwork without needing a pocket protector. Not much more to say. If you are too lazy to carry around two things, buy this 2-in-1 thing. It seems sort of weird that we’ve gone back to pen things in contrast to what Steve Jobs wanted, but you can’t deny that styluses themselves have come a long way, just like the devices with which they’re designed to be used.